In this article, you'll learn how to use exceptions on tests. Exceptions let you adjust the test's availability, time limit, retake, and proctoring settings to accommodate special needs for specific students. For example, if you make a test available for one day only, you can add an availability exception for a student who missed the window due to illness (while the remaining students will only be able to take the test in the regular availability window). In the main Course > Tests view, click the test's name. You'll land on the test's Design view. Or, on the assignment page associated with the test, click the test's name, which takes you to the Design view. In the right column under Information, you can add exceptions for availability, time limit, the number of retakes, and whether to require proctoring. Find the appropriate field and click Add an exception. In the dialog, select a student from the drop-down. As soon as you make a selection, his name will appear in the dialog. Enter the exception information—a new time limit, new due date, number of retakes, whether to require proctoring. Check whether to email the student about the exception. The dialog lets you add exceptions for multiple students: just repeat the above steps as often as you need. Click to remove a student's exception. 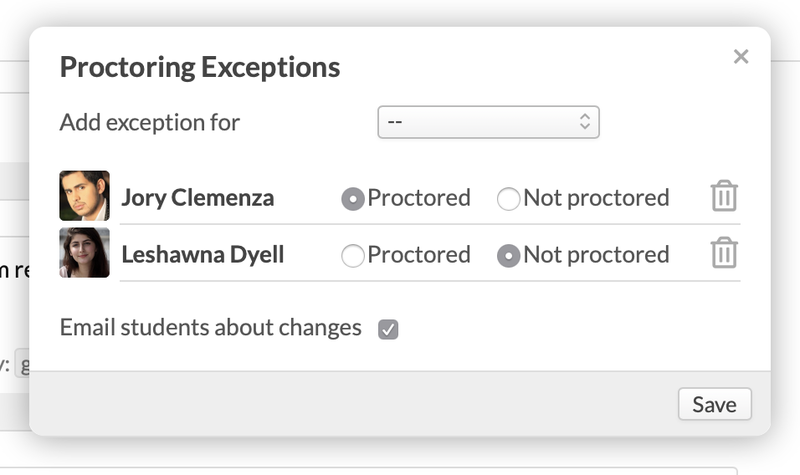 Under the appropriate field where you've added an exception, click Manage exceptions. Change the exception or delete it by clicking . How do I create a test with open-ended availability?